These are fixed price lists issued by dealers who specialize (or specialized) in paper collectibles. Some of these dealers hold huge inventories, while others hold very few. Some issue price lists on a regular basis, while others are very sporadic. Many of these dealers also issue Auction Catalogs. 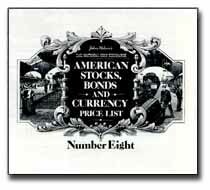 As a rule, these catalogs are only available in the American Numismatic Association Library and in the holdings of private collectors.